New Rochelle, September 11, 2018-A novel high throughput screening (HTS) assay compatible with an ion channel biosensor component was used successfully to identify selective and active small molecule modulators of G protein-coupled receptor 119 (GPR119), a promising target for the treatment of type 2 diabetes and related metabolic disorders. The development of this cell-based HTS assay and its miniaturization are described in an article published in ASSAY and Drug Development Technologies, a peer-reviewed journal from Mary Ann Liebert, Inc., publishers. Click here to read the full-text article free on the ASSAY and Drug Development Technologies website through October 11, 2018. Patricia McDonald, Ainhoa Nieto, Virneliz Fernandez-Vega and colleagues from The Scripps Research Institute, Jupiter, FL coauthored the article entitled "Identification of Novel, Structurally Diverse, Small Molecule Modulators of GPR119." The researchers describe the use of a HEK293 cell line to co-express the receptor of interest and the ion channel, which functions as a biosensor for cAMP. The group presented data indicating having met their goal, with more than 500,000 small molecules screened and 200 modulators of hGPR119 identified for further follow-up. They were also able to miniaturize the assay and implement it in a 1536-well plate format. "Prof. McDonald and her team have developed an efficient and robust assay platform to identify new hits for the treatment of type 2 diabetes. The congruence of GPCR screening and development of new drugs for diabetes and other metabolic diseases is of high interest to our readers," says ASSAY and Drug Development Technologies Editor-in-Chief Bruce Melancon, PhD, Director of the Chemical Synthesis and Drug Discovery facility at the University of Notre Dame. Research reported in this publication was supported by the National Institutes of Health under Award Number DK088125. The content is solely the responsibility of the authors and does not necessarily represent the official views of the National Institutes of Health. 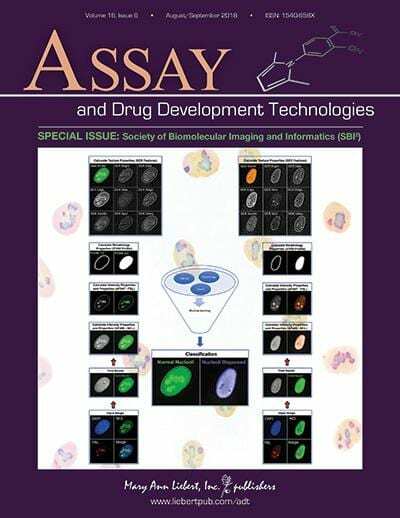 ASSAY and Drug Development Technologies is an authoritative peer-reviewed journal published 10 times a year online with open access options and in print. Led by Editor-in-Chief Bruce Melancon, PhD, Managing Director of the Chemical Synthesis and Drug Discovery facility at the University of Notre Dame, the Journal provides early-stage screening techniques and tools that enable identification and optimization of novel targets and lead compounds for new drug development. Complete tables of content and a sample issue may be viewed on the ASSAY and Drug Development Technologies website. Mary Ann Liebert, Inc., publishers is a privately held, fully integrated media company known for establishing authoritative peer-reviewed journals in many promising areas of science and biomedical research, including Applied In Vitro Toxicology, OMICS: A Journal of Integrative Biology, and Genetic Testing and Molecular Biomarkers. Its biotechnology trade magazine, GEN (Genetic Engineering & Biotechnology News), was the first in its field and is today the industry's most widely read publication worldwide. A complete list of the firm's 80 journals, books, and newsmagazines is on the Mary Ann Liebert, Inc., publishers website.